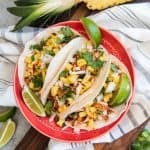 Enjoy these easy, delicious Pork Tacos al Pastor made at home on the grill in about 20 minutes (minus the marinating time) for your next Taco Tuesday! Slice the pork loin into thin slices, no more than 1/2-inch thick. Transfer to a large bowl or heavy duty zip-tight bag. In a blender, combine the onion, pineapple, orange juice, white vinegar, garlic, chipotle pepper, ancho chili powder, achiote powder, cumin, oregano, and salt. Blend until smooth, then pour over the thinly sliced pork. Seal or cover and refrigerate for at least 4 hours, but up to 24 hours, to marinate. Heat a grill to high heat, then remove the meat from the marinade and grill over direct heat until cooked through, about 2-4 minutes on each side depending on the thickness of your pork. Grill the remaining pineapple at the same time by first cutting it into wedges then grilling over high heat for 4-6 minutes per side, until warm and slightly charred. Transfer the grilled pork loin to a cutting board and stack, then slice thinly to get that shaved taco meat look. Pile the chopped grilled pork on warm flour tortillas with the diced white onion, diced grilled pineapple, chopped cilantro, and a lime wedge, then serve.